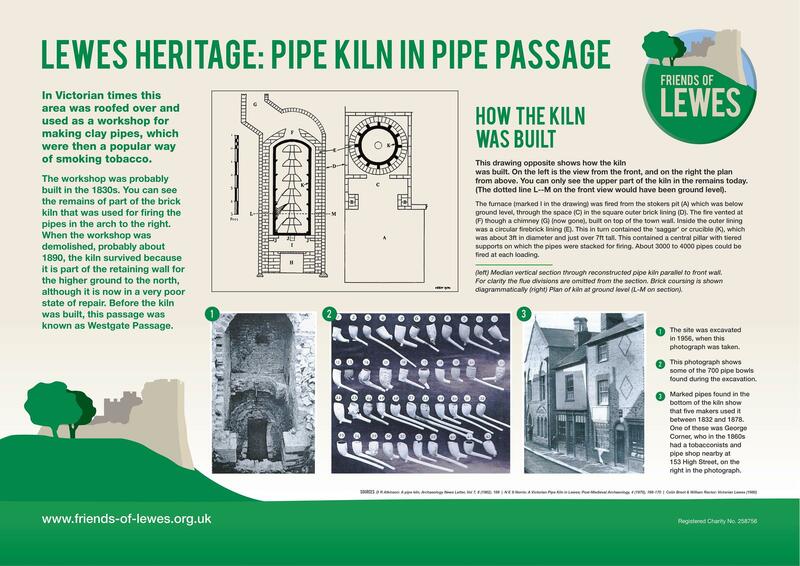 The pedestrian way that leaves the upper High Street beside the Freemasons Hall and connects to New Road is Pipe Passage – and its history is now explained in an information board, recently put up by the Friends of Lewes. For most of Queen Victoria’s reign clay pipes were made and fired in a large kiln on the western side. Though only part of the remains of this is now visible, the board explains the manufacturing process through text, illustration and photographs. The story behind the names of other streets in Lewes is fascinating too and can be followed in the revised edition of The Street Names of Lewes, published by Friends of Lewes and available from the Tourist information Office.